I’m a C. Would that make me a better candidate for an accounting job than an S? It’s obviously not enough information to make that kind of decision. And I can tell you I’d be a mediocre accountant—at best. Even though I love charts and being right, I have no interest in that field and no proficiency at it. It’s not the right challenge for me. I’m an iD. I love change and I like to move fast. I’m good at engaging with people. I should be good at sales, right? I am! But I’m not good at cold calling; I’m only good at closing the sale. If you compared my profile to one of your successful “hunters,” you might think I’d be highly successful and we could both be disappointed. How can DiSC® be used appropriately? 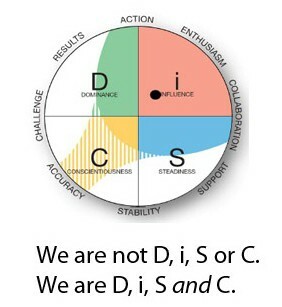 Does the DiSC profile match how the candidate is presenting herself? If it does not, then you might want to schedule another interview to ask the candidate additional questions. Is it likely that the job duties take the candidate outside of his comfort zone? If so, then again you might want to tailor some of your interview questions towards the candidate’s resiliency and goals, and judge those against your organization’s needs. Does the candidate bring a style to the team that is currently missing? If so, will the team manager be able to help her integrate into the team and will the team accept her? Is the team in need of and ready for internal challenges? Have you checked your own bias? Do you or your organization tend to hire people of similar types? Do you just find it easier to interview certain types? Do you make assumptions about the leadership abilities of a D? You know that two people who receive a strong D profile might appear to approach a problem in a similar way but get two entirely different outcomes. So how can you get past your own bias or help a hiring authority get past hers or his? Are you hiring to meet business goals or to remain in a comfort zone of your own? Remember that the Everything DiSC model is a circle. When you look at a candidate’s Everything DiSC Workplace profile, you’ll see that a bit of each style is represented within the circle. So each person has the ability to adapt his or her style. The profile does not tell you how good the person is at that. You need to determine communication skills, people skills, technical skills, leadership skills through other techniques. If you see a profile in which it looks like the candidate might struggle with displaying personal warmth, for example, you can use that information to ask the candidate to tell you more about how they’ve used that trait to make a sale. You can look for how adaptable and flexible the candidate is. DiSC gives you additional data that you can use to structure your interviews and add to the other data you gather during your hiring process. It should never be used as a single or short-hand indicator of a candidate’s suitability for a job. We’ve been surprised to learn that some hiring managers do not share the candidate’s profile with the candidate. Keeping the profile to yourself is passing by an opportunity to offer your candidate something more to make them feel good about you. It can make you stand out as an employer who is engaged with its employees. Frankly, keeping the profile to oneself is a little creepy and makes DiSC seem more like a lie detector test. You can also use DiSC to explain your organization’s or department’s culture to a candidate. If all the employees have taken the assessment and you have a Group Report handy, it can help you quickly describe how the group behaves. It can complement documents you might provide on a department’s goals, mission or plans. DiSC is not recommended for pre-employment hiring screening because it does not measure a specific skill, aptitude or factor specific to any position. DiSC instead describes one’s work behavior patterns or style. DiSC is a user-friendly, high credibility, low-cost tool used by many during the hiring or on-boarding process. Be sure to use it responsibly. Our most popular DiSC product used during the hiring and onboarding process is the Everything DiSC Workplace Profile. If you’re confident that there are personality traits that will influence someone’s success in a specific job, you can use a selection tool like PXT Select that’s been validated for hiring and includes personality as well as cognitive assessments. It’s nice to learn that this DiSC profile system can be used not only in the workplace but also to better assess the applicants during the interviews. That should be very helpful for the companies since it would open up new ways to learn more about your potential new employees. Additionally, you can even find points of improvement on them even before hiring them. That would surely make things more convenient and easier. Thanks for the interesting and informative article about using the DiSC profile model in hiring!